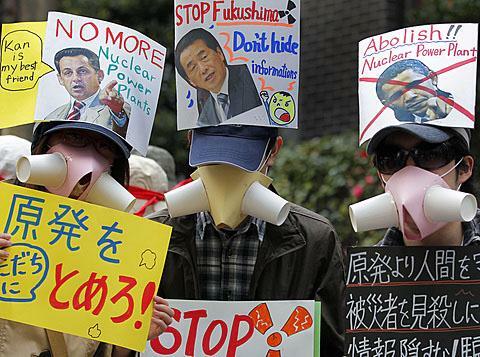 Around 3,000 people marched through central Tokyo on Sunday to protest the Hamaoka nuclear-power plant, which is located about 200 kilometers southwest of Tokyo in Shizuoka Prefecture—the heart of a region that seismologists believe is well overdue for a massive undersea earthquake of a magnitude 8 or higher. After Bahrain’s interior ministry acknowledged that two political prisoners had died in custody last week, the daughter of a detained human rights activist began a hunger strike on Monday, calling on the authorities to release her father and other members of her family who have been arrested. Tens of thousands of Yemenis filled the streets of Sanaa, Taiz, Hudaydah, Ibb and the southeastern province of Hadramaut on Monday to protest the Gulf Cooperation Council’s plan for Saleh’s removal. Soldiers and police moved into Cairo’s main square on Tuesday to end a five-day sit-in by protesters demanding civilian rule and swifter prosecution of Egypt’s former president and his allies. Irish Greenpeace volunteers held a protest outside Facebook’s Dublin office yesterday, calling on it to phase out its use of coal power. Protesters chained themselves to a ladder inside the State Government’s offices in Melbourne, Australia on Monday and called on the Government to withdraw its support for a proposed coal and gas-fired power station in the Latrobe Valley. Workers at Buenaventura’s Uchucchacua silver mine in Peru have lifted an eight-day strike seeking higher bonuses and better working conditions, but a protest by villagers with their own set of unresolved problems stemming from the mining company kept the workers from returning. Internet users in Dushanbe have staged Tajikistan’s first-known flash mob in order to protest the state electricity provider’s inability to provide uninterrupted power supplies. Activists barricaded a road outside the London offices of Electricite de France SA on Monday to protest plans by Europe’s biggest power producer to build a new generation of U.K. nuclear power plants. Hello $author, your text on this page is really amazing. Its symply fantastic material that you shared here. So one more time, $author, I can not wait to see more of this. OK $author, this is really a great inspiration.